BusyCal may display an alert stating that the following events could not be stored to the server. 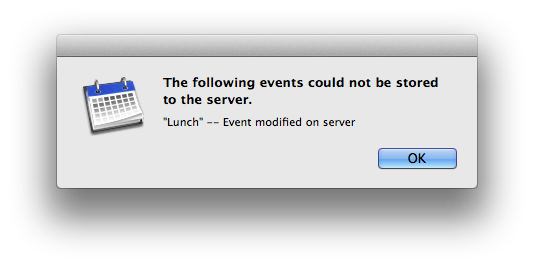 That error occurs when the event you modified in BusyCal is stale and out of sync with the event on the server. This can happen if you are syncing multiple devices or apps with the server and the event was recently modified on another device or in another app. When this occurs, the change you made in BusyCal will be rejected by the server and replaced with the copy of the event on the server. We plan on improving this by attempting to auto-resolve such conflicts during sync in an upcoming update. could not store on server. modified on server.